One of the best luxury inns in Colorado! The Niwot Inn and Spa is centrally located in historic Downtown Niwot, with its quaint shops, restaurants, and art galleries. Just ten minutes from Boulder’s renowned Pearl Street Mall, 50 minutes from Denver and 45 minutes from Estes Park, the Niwot Inn is accessible to everything you’ll want to do on your next visit to Colorado. 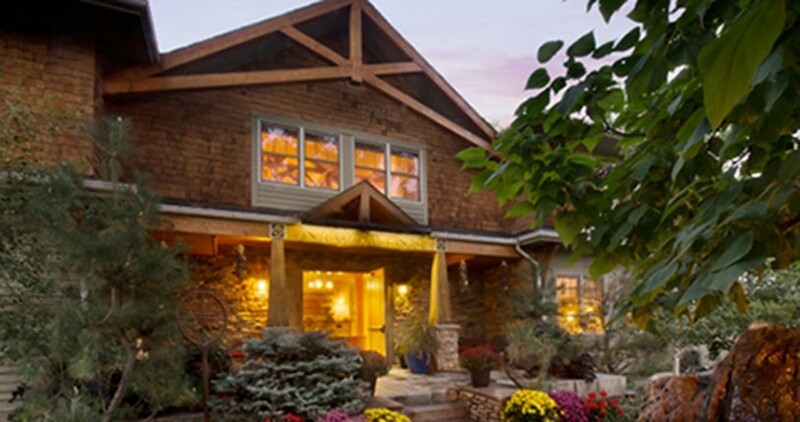 There are few bed and breakfasts that capture the exceptional high-end, luxurious appeal of the Niwot Inn. Affectionately called “The Inn,” our little corner of paradise offers a tranquil and relaxing experience away from the hustle and bustle of big city life. Our Inn is situated on a beautiful tree-lined street with large cottonwoods on the front lawn and a bubbling natural stone fountain to delight your senses as you relax on the main deck. The Niwot Inn features fourteen luxurious guestrooms, each distinctly unique with handcrafted features and top-of-the-line amenities. From the walls of hand-plastered Native American clay to the solid hand-built tables and floor-to-ceiling natural stone fireplaces, the Inn invites you to relax and soak up the warm, comfortable ambiance. Read a book or sip a local wine by the crackling fireplace in the Great Room. Relax in your guestroom by your personal fireplace and sink into lush bedding in a handcrafted bed. Pamper yourself with a massage before going out for a fine dining experience with family or friends. Our staff is dedicated to the highest quality of service at (what we believe) is the finest bed and breakfast in the state of Colorado! We promise that you’ll be planning your next visit after just one night’s stay with us.